Buckle up, Breaking Bad fans! According to The Hollywood Reporter, a movie set in the Breaking Bad universe is in the works, and series creator Vince Gilligan is once again at the helm. 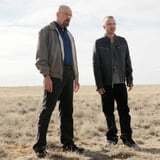 It's been 10 years since the hit AMC show premiered, and five since it ended, yet viewers still miss the dark and dramatic story of Walter White and Jesse Pinkman. While details about the film remain unclear, the two-hour movie will reportedly follow a kidnapped man as he escapes and seeks freedom, and it will begin filming in New Mexico next month. No word yet if fans can expect the movie in theaters or on the small screen, or if stars Aaron Paul or Bryan Cranston are slated to return.